If you want to feel ashamed of yourself, then I suggest you read this story about parachute-jumping, bomb-sniffing, special forces dogs. Seriously, these dogs are more accomplished than anyone I know, and they doesn’t even have thumbs! The dogs earned theirwings as part of Operation Cold Response, Europe’s biggest war games operation in Norway. The Belgian Shepherds, along with their Austrian special forces handlers, SAS troops, and Royal Navy Marines, strapped on parachutes and jumped 10,000 feet as part of the operations. 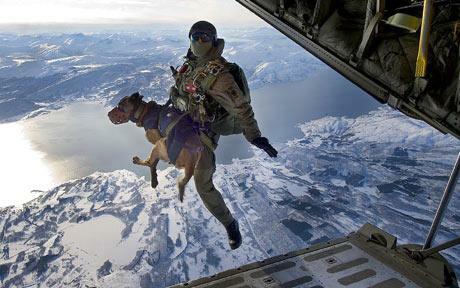 Apparently, the dogs don’t mind jumping out of airplanes. Said one handler, “They don’t perceive height difference the same way humans do, so that doesn’t worry them. They’re more likely to be bothered by the roar of the engines, but once we’re on the way down, that doesn’t matter and they just enjoy the view.” The same can’t be said of most recruits!